But for me, superheroes are much more than just the characters they portray. As a kid, I soley read superhero comics. They were my world because I could connect with these characters, even as a kid. The X-Men weren’t just mutants, but individuals who were different than everyone else. As a kid who wore glasses and was super duper shy, I could relate to feeling different in everyone else’s eyes. 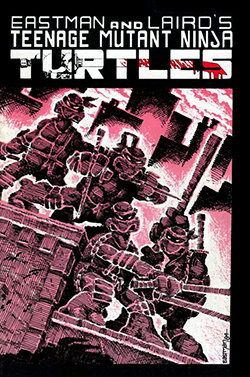 The Teenage Mutant Ninja Turtles weren’t just a group of mutated beings who fight for justice. They were role models for a kid who was still developing the concept of right and wrong. Ultimately, these superheroes introduced me to the world and society around me. And it’s only natural that the comics I read opened up the doors to other types and genres of comics. 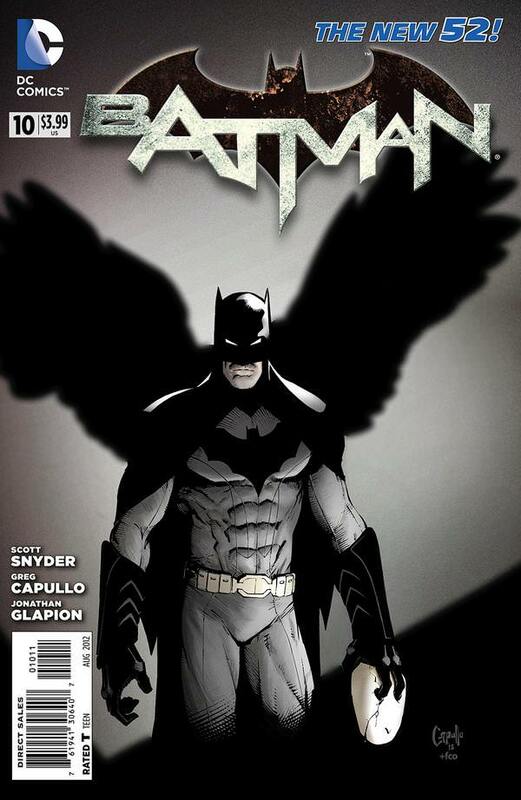 It’s a natural order of things since if you are picking up your superhero comics at your local comic shop or even perusing the digital offerings on Comixology, there are so many opportunities for you to discover other comics that may interest you. Let me fill you in on a little secret. If you are a huge fan of the DC character, The Batman, you can find a character similar to him at the other publishers (cough, cough, Marvel’s Iron Man), which opens up a catalog of new stories that you can read about Iron Man. Plus, let’s say you finally pick up that book that you pass by in the Horror section of the shop on the way to the register and realize that it’s really cool. And now you’re going to look up that specific writer or artist to see what else they worked on. Those are the best moments to have as a comic book reader because at the core of the comic is the ability to transport you to another world, another place. Thanks to the collaboration with superb artwork, that world is fleshed out much more visually for you every time you pick up a new book to read. Now, I’m not saying that you have to check out other characters or genres. As comic book readers, the freedom to read whatever interests us is super important. If you enjoy reading superhero books, by all means, keep reading them. If you are opposed to superhero books and rather read more sci-fi type books, then you should totally check out Brian K. Vaughn and Fiona Staples’ Image Comics book, Saga. It’ll blow your mind! Gene wrote a review about Saga that you can find here, and if it piques your interest, then I implore you to check it out. Another personal realization is when I got back into comics, I primarily read DC and stuck to what DC had to offer. But I kept my options open to other publisher’s offerings and was surprised at what epic stories and artwork they had. What’s nice for us readers is that there is such a huge catalog of stories to choose from, old and new. And the possibilities are endless! Today, my pull list still consists of superhero comics from all publishers but it does have some books that I came across because I was perusing my local comic shop for something different or a title or two that I learned about at a comic book convention. This isn’t a plug or anything, but I enjoy how Image Comics displays one page ads for their own creator-owned books under the Image Comics banner. I’ve picked up a few because of those ads and I’m sure I’ll discover new ones again in the same way. 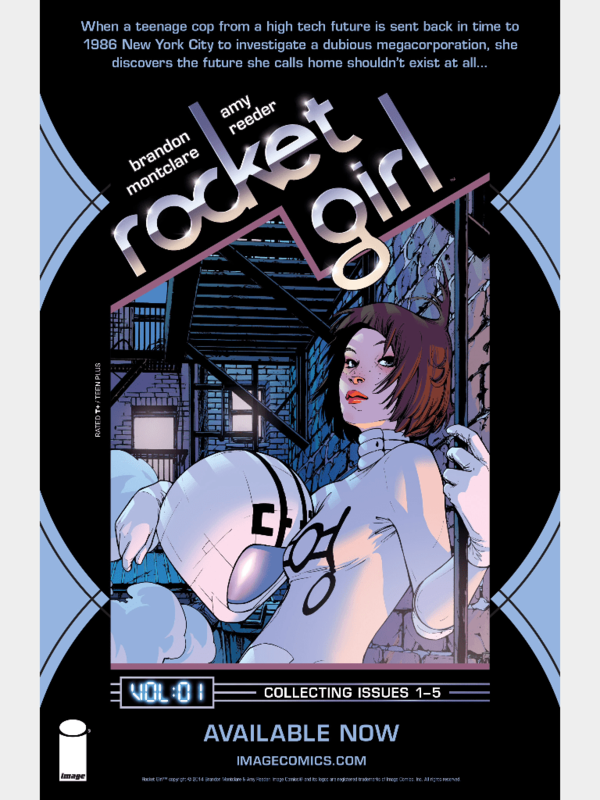 The example below is Rocket Girl by Brandon Montclare & art by Amy Reeder. 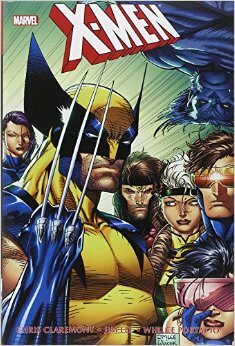 As an avid comic book reader, I believe it doesn’t matter how you got to this book or that book. What matters to the creators and publishers is that you are purchasing and reading their stuff. And from my experience, superhero comics was my gateway drug into the other genres that comics offered. Of course, I’m biased whenever someone asks me to suggest a comic that I think they should read, since I gravitate towards certain superhero characters. But my hope is you’ll follow in my footsteps and discover the other stories that’s out there and who knows, maybe you’ll find something that I may enjoy! So send in those recommendations (leave a comment)! And perhaps, it may end up reviewed here on Shortboxed! Write What You Know | Nerd Me Up.